The Enbridge Line 9 project was broken into two sections when submitted to the National Energy Board (NEB). The Line 9A reversal (Sarnia to North Westover) was approved in July, 2012. The Line 9B reversal (North Westover to Montreal) and Line 9 capacity expansion project was approved in March, 2014. The Line 9B approval included a tariff change to allow heavy crude (Oil Sands) to be shipped through the pipeline. Line 9 is also expected to transport Bakken crude, which has been subject to close public scrutiny lately due to the frequency of explosions by trains carrying the crude by rail. With so much focus on Line 9 during summer 2013, another Enbridge pipeline – Line 7 – was quietly approved for a capacity increase to 180,000bpd. Line 7 runs from Sarnia to Westover along the same right-of-way as Line 9A … and Line 8. You get the idea. What makes the story even more interesting is that Enbridge has two more crude oil pipelines that run south from Westover Station – Line 10 and 11. These pipelines were built in the same era as Line 9 – with the same outdated single layer polyethylene tape – and are already approved to transport heavy crude. Line 10 crosses the Niagara River just up from the falls, on it’s way to the Warren, Penn refinery in the United States. Line 11 runs to the refinery in Nanticoke operated by Imperial Oil – a subsidiary of ExxonMobil. Put all the pieces together, and it becomes very clear that Westover is the hub of Enbridge’s pipeline network in Ontario. This area is about to see a whole lot more of Enbridge as well. On Jan 17th, 2013, the company filed for a 3.2km replacement of Line 11. The application for the Line 10 replacement project – almost 40km – is expected in the coming months. So how does all this oil get to Sarnia to begin with? Well, Enbridge Line 5 crosses under the Great Lakes at the Straits of Mackinac and was just approved for a capacity expansion. Line 6B – yes the one that ruptured in Michigan – is being replaced with a capacity increase as well. Combined, Line 5 and Line 6B will feed over One Million barrels per day of crude into Sarnia’s chemical valley. Then there’s always the possibility of a renewed Trailbreaker project. Initially proposed in 2008, it was cancelled due to what Enbridge called a “sour economy”. It’s true, 2008 wasn’t the greatest year for large scale projects and capital investment. Although Enbridge professes that the current Line 9 reversal project will go no further than Montreal, the fragmented steps being taken by Enbridge are suspiciously similar. The capacity of the Enbridge main line from Alberta is being expanded, Line 5 is undergoing a capacity increase, Line 6B is being replaced with a larger pipe, and Line 9 is before the NEB for reversal. The only piece missing is the reversal on the Montreal-Portland pipeline which provides access to the Atlantic Ocean at Portland, Maine. In addition, the two Quebec refineries (Suncor and Valero) are only capable of refining 400,000bpd. They are also served by rail and expected to be a drop off point for TransCanada’s Energy East project. So, either these refineries are about to undergo some major renovations, or more oil is heading out to the coast than we’re being told. On December 4th and 5th, 2012 – 6 days after the Line 9 application – the University of New Hampshire’s Center for Spills in the Environment conducted a training seminar on Oil Sands products, which was sponsored jointly by the Maine Department of Environmental Protection, Response Services, and the US Environmental Protection Agency. The event was held at the University of Southern Maine. Presentations included a talk from Heather Dettman (Natural Resources Canada) who spoke about “Characteristics of Oil Sand Products” and Bruce Hollebone (Environment Canada) who made a presentation about the “Fate, Behaviour & Modelling of Spilled Oil Sands Products”. Interesting coincidence? Many people are unaware about the proposed changes to the aging 38 year old Line 9 oil pipeline. Many more are unaware about Enbridge’s pipeline expansion plans over the next 12-18 months. Line 9 appears to be only a small piece of the puzzle to ship increasing amounts of oil east and south. 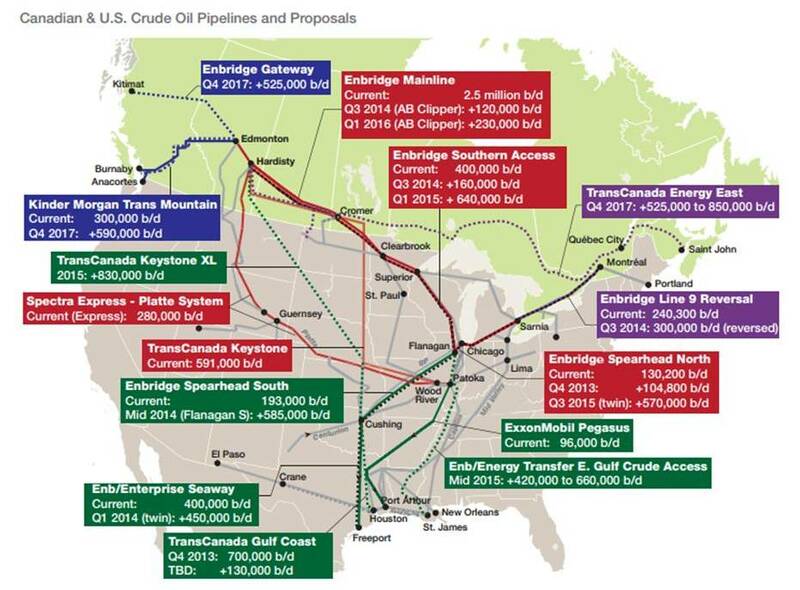 Enbridge currently has numerous applications filed with the NEB to expand it’s connections with the Alberta Oil Sands and North Dakota Bakken formation. These include replacing the existing Line 2 ($117M) and Line 3 ($60M) to expanding the Edmonton terminal ($800M) and preparing to apply for a new pipeline to connect Athabasca Oil Corp’s planned Hangingstone project to it’s regional pipeline network ($200M). In addition to Line 9, Enbridge is seeking approval for capacity expansion in many of its existing pipelines. Line 67 will be increased to 880,000 bpd. Line 5 could increase to 541,000 bpd. The 30 inch diameter Line 6B (3,000,000L Kalamazoo River Spill 2010) is being replaced with a 36 inch pipeline and could carry up to 570,000 bpd. To boot, the new Line 6B is scheduled for a further capacity increase in 2016! Numerous other Enbridge projects are ongoing in an attempt to ship more oil to the Gulf of Mexico. 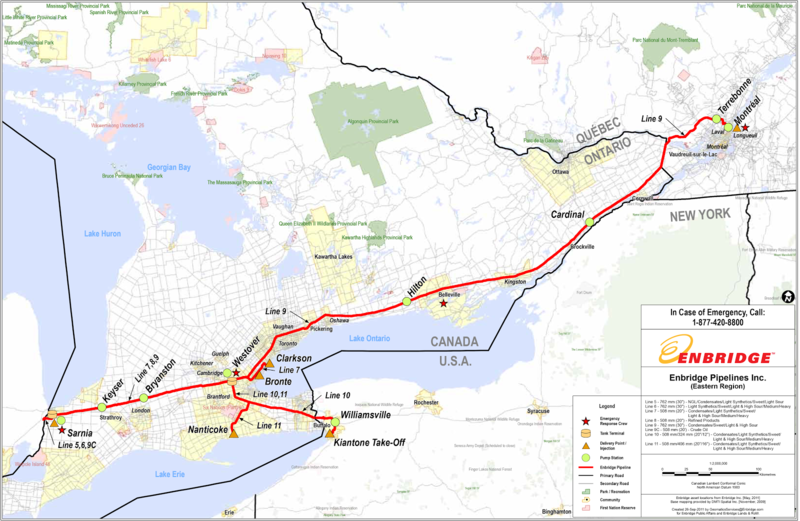 Line 61 is the Southern Access Project which Enbridge is seeking to increase the capacity to 1,200,000 bpd. Line 61 would connect the increased capacity Line 67 (Alberta Clipper) to the proposed new 300,000 bpd Southern Access Extension. The proposed new Flanagan South line would then connect the Southern Access Extension to Cushing, Oklahoma where it meets the Seaway pipeline which Enbridge is seeking to increase capacity from 400,000 bpd to 850,000 bpd. Quite the flurry of activity, but very little discussion. Perhaps it’s time to step back and really take a good look at the bigger picture. All of these projects are expected to be in service by mid to late 2014. The great rush in pipeline construction and capacity increase is being forced by the gold rush mentality in the Oil Sands and Bakken shale formation. All the while, greenhouse gas emissions continue to be spewed into our atmosphere and we turn a blind eye to runaway climate change.